Systematics of Gastropoda: Clade Caenogastropoda: Lithoglyphidae. ver Danube between Plesching and Steyregg). Description: The gravel snail has a bulbous shell with a strong wall coloured a brownish grey green. The apertural whorl dominates the whole spire. The animal itself has a characteristically broad foot. Males are often smaller than females. The animal is coloured dark grey in its upper part and lighter grey on the bottom. The body is covered in golden yellow dots and spots. Dimensions: H: 7 - 10 mm; W: 7 - 10 mm; N: 4½ - 5. (Abbreviations). Habitat and Distribution: The gravel snail lives in slow flowing rivers. They can be found on firm muddy ground, on stones and on wood. Lithoglyphus naticoides needs a high content of oxygen and calcium carbonate in the water. 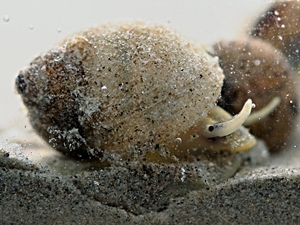 The gravel snail originally came from tributaries of the Black Sea. At least since the Pleistocene it has been found in the Danube river, where it spread as far west as Regensburg. In the Neolithic era, gravel snail shells were used for ornamental purposes. Only since 1883 gravel snails have also been introduced by ship into the North of Central Europe, in the rivers Rhine and Elbe, as well as in the Baltic rivers. Threat Situation: Since 1960 the species is declining fast in central European waters because of water pollution. In Saxony-Anhalt and Baden-Württemberg, it is endangered (EN), in the rest of Germany it is classified as vulnerable (VU). In some places, though, the populations are recovering (see also: IUCN Threat Categories). Francisco Welter-Schultes: Lithoglyphus naticoides species homepage. Molluscs of Central Europe: Lithoglyphus naticoides. Vollrath Wiese: Lithoglyphus naticoides, with pictures. Fechter, R.; Falkner, G. (1990): "Weichtiere"; p. 126, 127 (1-2). Fischer, W.: "Beiträge zur Kenntnis der Molluskenfauna Österreichs XXVII. Lithoglyphus naticoides (C. Pfeiffer 1828) - oder wie aus einem Inländer ein Zuwanderer wurde". Nachr. Bl. d. E. Vorarlb. Mal. Ges., 19, p. 27 ff.